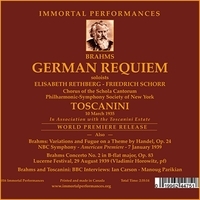 “The Brahms REQUIEM (sung in German) here is a great gift to the world. 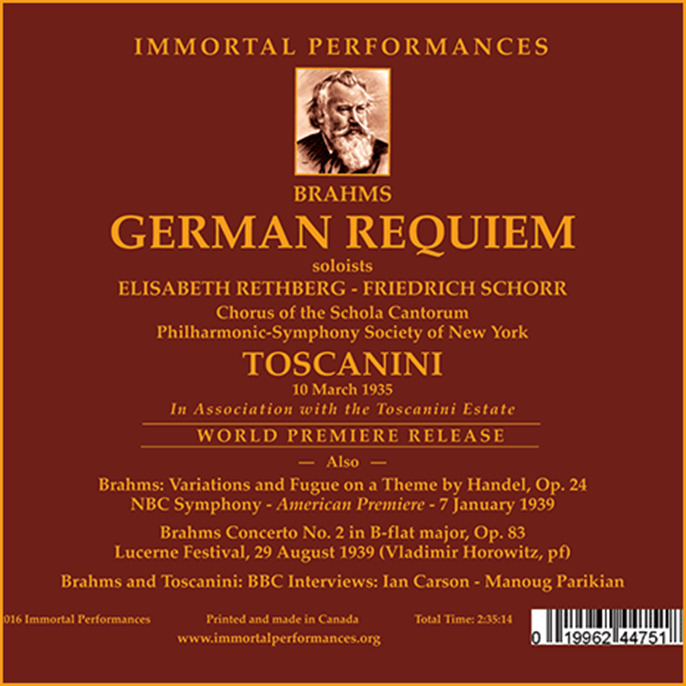 Authorized by the Toscanini Estate to issue this vitally important historical performance, the folks at Immortal Performances have done sterling work in presenting it in eminently listenable sound, and offering the ideal complement to the previous Toscanini/Brahms set (IP 1025 [C1077]). After a very atmospheric introduction by Davidson Taylor to this broadcast performance of Brahms’ EIN DEUTSCHES REQUIEM, Toscanini directs a beautifully sculpted performance of the first movement. In the accompanying booklet, Richard Caniell goes into some detail about the difficulties presented in the transfer of this performance; given this background, the arrival here of this REQUIEM is nothing short of a minor miracle. In terms of what we get, the detail is astonishing, particularly in the lower registers, while the chorus is extremely well balanced with no loss of soprano tone as the pitch rises. The second movement (‘Denn alles Fleisch’) is markedly slow, almost as if dragging its feet, a sense of ominous dread throughout; the entry of the chorus is the perfect prolongation of the orchestra. One of the great worries in any historical recording is whether the sound will take the heaven-storming climaxes of the second movement; it does, despite the inevitable intrusion of some surface noise. The sudden ‘Aber des Herrn Wort’ is phenomenally effective. Schorr’s ‘Herr, lehre doch mich’is absolutely laden with sadness. His voice has great presence (the tessitura does sound rather high for him, though). Toscanini’s grasp of the emotive power of this movement is miraculous. Certainly, there are challenges - plummy pizzicato lower strings, and the last choral section is rather overshadowed by the rolling timpani - but nowhere is the integrity and sheer heft of the performance compromised. Schorr’s return later in the piece is even finer, imperious and almost triumphalist. Schorr’s companion is the great Elisabeth Rethberg, magnificent in her first angelic phrase (‘Ihr habt nun Traurigkeit’) a moment that alone is worth the price of the set. Rethberg provides incomparable singing that needs to be heard. It is the apocalyptic nature of ‘Tod wo ist dein Stachel?’, defiant and full of drama, that seems to sum up Toscanini’s Brahms REQUIEM, and his excellent chorus does not let him down. It is apocalyptic in feel; the final movement is astonishing in its power, and I can think of no higher praise for the restoration than to state that one has to concentrate on the background swish to find it. 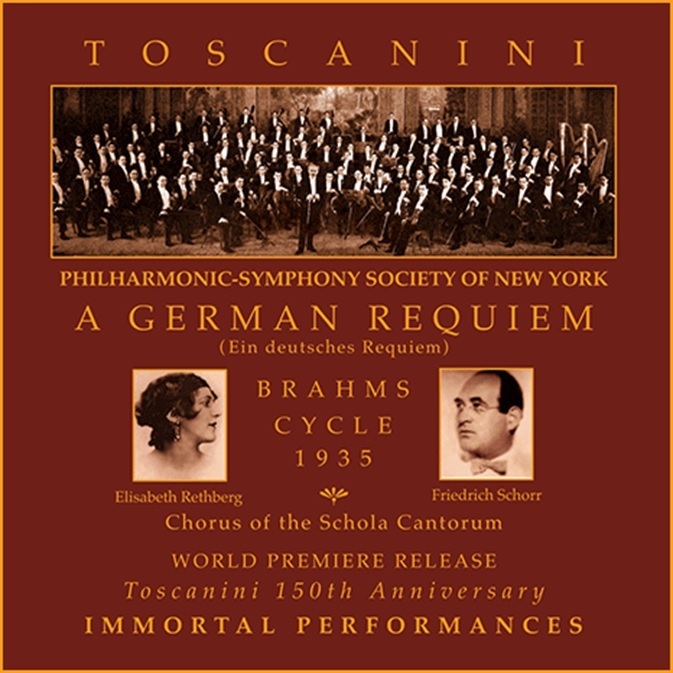 This is more than an indispensible supplement to Toscanini’s 1943 recording with the NBC Symphony and Westminster Choir (soloists Vivian Della Chiesa and Herbert Janssen, on Guild and Naxos Historical and performed, one should add, in English). About the Brahms-Rubbra Variations on a Theme by Handel: This is the American premiere of the Rubbra orchestration. The theme is heard cleanly; but already in Variation I Rubbra begins to add in his own accent. Yet Variation VIII sounds like pure Brahms in orchestral mode, the Brahms of the granitic First Symphony specifically. The woodwinds in particular are in fabulous form throughout, and Variation VII furnishes a great example of their prowess. Amazingly, one can hear the subterranean double basses of Variation X perfectly well, just as one can appreciate the terrific fleetness (and even happiness) in Variation XIV. There is sheer magic to Variation XXII, where we can hear through the years Rubbra’s impeccable grasp of the orchestra, while the recording provides a terrific, snappy presence to the pizzicato strings of Variation XXIII. The accuracy and vigor of the (arco) strings in Variation XXVI is part of the essential lead-in to the work’s blazing final pages (the closing fugue). Toscanini’s vision over the course of these 26 variations is little short of magnificent. The Brahms First Concerto with Horowitz from 1935 had been included in a previous Brahms set by this company (IP 1025). Here is a rare outing for a Lucerne performance of the Second Piano Concerto; the orchestra, we are told, included both Adolf and Hermann Busch. Yes, the recording balance is skewed at the opening (the solo horn could be a distant alphorn, the piano right up close and personal), but who would want to lose out on the magnificent sweep of Horowitz’s playing? The variety of tone and dynamic is remarkable, and how wonderful that the recording allows us to appreciate this vital facet of his playing. Horowitz and Toscanini are very much on the same page throughout; the blazing final pages of the first movement are testament to that alone. The orchestral intensity in the second movement is simply remarkable, matched by Toscanini’s magnificent touch; we hear the imposing resonance of the piano bass register too, as the movement hurtles towards a close. The slow movement flows beautifully, with Caniell’s restoration bringing a beautiful sense of presence (the recording notes speak of a shift from first to second balcony perspective over the course of the piece, which he has worked to correct as far as humanly possible). Horowitz’s gossamer touch is more than adequately caught at the finale’s opening, as is the magnificent nature of his staccato and the fury of his outbursts. Some readers might know the Horowitz/Toscanini October 1948 performance in clearer sound on Music & Arts (1077), but the present performance has a special quality that shines through the sonics. “Arturo Toscanini’s penultimate season as music director of the Philharmonic Symphony Society of New York, as it was then styled, included programming both substantial and unusual. Despite the rigors of economic depression, a four-week Brahms cycle was presented in February and March, and, at the end of April, Beethoven’s MISSA SOLEMNIS. World renowned soloists graced the Carnegie Hall stage, and for the choral works the superb Schola Cantorum under the direction of Hugh Ross, then early in his lengthy and distinguished tenure. Immortal Performances has previously issued the other items from the Brahms cycle (IPCD 1025 [C1077]). The GERMAN REQUIEM here demands attentive listening and some few details must be taken on faith. (The Brahms/Rubbra Variations are in good 1939 Studio 8H sound—better than many 8H offerings.) That attention will be well repaid, for this REQUIEM performance is self-recommending: it is, to my ear, the most compelling performance I have ever heard of a work which has been central to my listening repertory for over six decades. This broadcast of Brahms’ greatest choral work has never before been available on disc. It is a premiere which is perhaps the jewel in the crown of releases from this label to honor the 150th anniversary of the conductor’s birth. No one expected this concert performance of the REQUIEM to be available for general hearing. The Toscanini Estate consigned this item and many others to the Rodgers and Hammerstein Archives in New York City, and it had remained there for some time. Caniell was able to persuade those responsible for the estate to consider restoration, but when he heard the transcription, it seemed an almost impossible undertaking. Caniell has told me in correspondence that this restoration is the most difficult technical challenge he has had to date. In addition to two full remasterings, I have been enabled to hear over a dozen samples of ‘disaster’ spots in the original. In addition to the usual obstacles inherent in dealing with old broadcasts such as balance, drop out, and audio interference, this transcription was afflicted with a sizzling overlay as if a sonic frying were taking place. The restoration process has overcome that to the point where we hear a realistic presentation of choral and orchestral tone. To my ear, and I believe motivated listeners will agree with me, one can hear in this release a performance for the ages. What do I mean by such an encomium? I think it is generally agreed that probably the most important single characteristic of Toscanini’s performing style is the almost unequalled intensity he brought to his music-making. There are times when, to some, that intensity seems more than the music can bear. In some works he strikes some listeners as too hard driving, and the complaint ‘too fast’ is leveled. But, Toscanini was not always ‘fast’ and, in particular, was not always ‘faster’ in his late years. What I sense in this 1935 concert performance is not whether it is fast or slow, but a sense often of time standing still - stasis in the most positive sense of the term - and then, at several points, of the great conductor letting go and releasing from his forces an incredible burst of energy. Some conductors (Walter notably, and most effectively) emphasize the lyricism of the piece, particularly the first two sections. Mengelberg is a bit less reserved than Walter, but essentially lyrical. Kempe, with broader tempos, does not discount lyricism but is more rhapsodic at times. Klemperer is a bit more granitic, as one would expect, but never slow, and thanks to his stern approach he is the only conductor I’ve heard to equal Toscanini in the big moments.